What is the single most important item on your bike? If you think about it, probably the most overlooked and potential self-inflicted hazard for us riders - tire pressure and leaks from impalements while we ride. 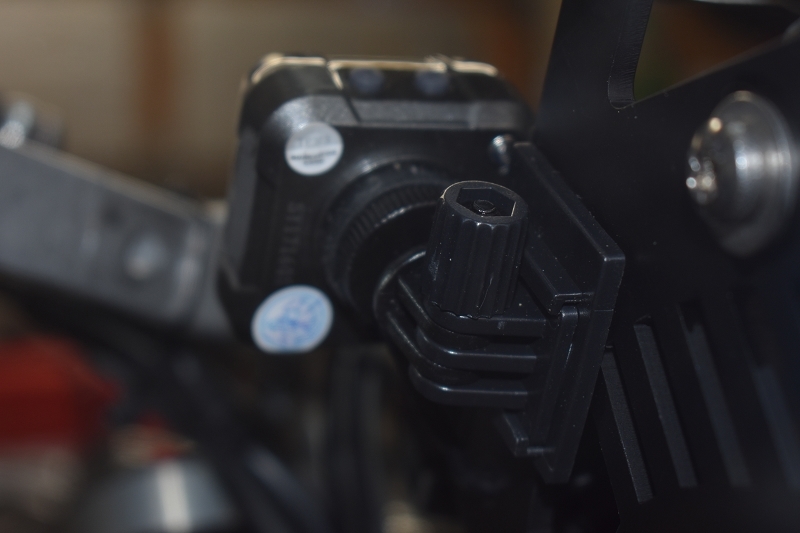 Now monitor that with the Cyclops TPMS.Now update your bike with a Cyclops Tire Pressure Monitoring System. Get real time info on tire pressures and tire air temperature. A huge safety advantage, know what your tire pressures are when you jump on your bike. 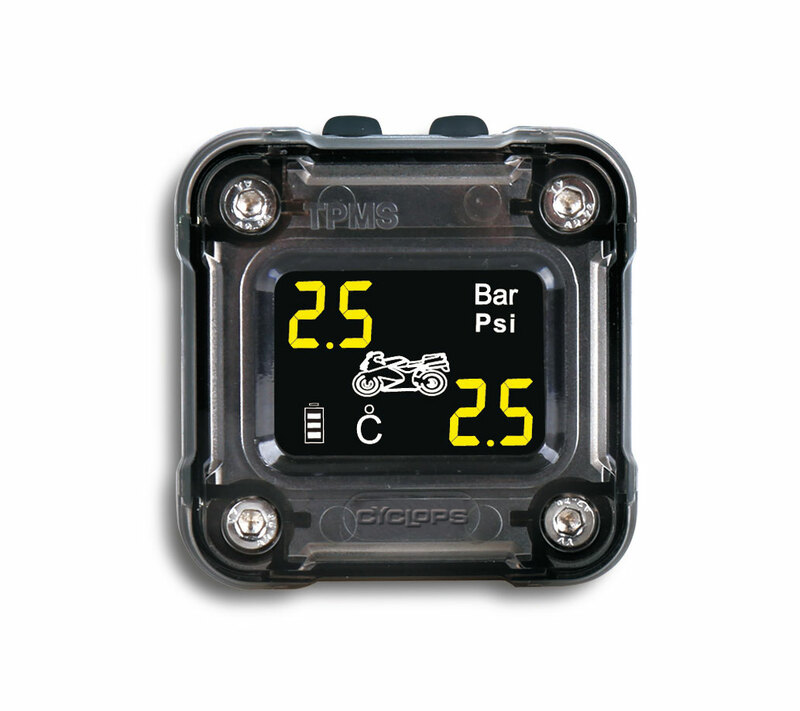 Easy to install and operate, this system uses replacement valve caps to actually show your tires' current air pressure and temperature on the multi-color display. Set an audible alarm for low and high pressure warnings. Red warning light for perimeter deviations. We recommend using metal valve stems when using this product. - Runs from 12V dc power, No replacing batteries or recharging on the display. - 2 sensors included, with an extra set of batteries. Only took one time to pay off! I installed the system installed on my 2008 GSA about 1 year ago.. In general, I find it a nice reference for pressure , but also as a rough indication of tire temp. A couple of weeks ago, I topped off my front tire about an hour before leaving for work ( early in the am, dark and below freezing temps ). When I was leaving the driveway, I thought I noticed the steering was a little vague when I turned, but wrote it off as the bike ( and me ) just waking up. A half mile down the road, the red blinking light on the display alerted me, I checked the readings and the saw the front tire only had 11 psi of air! ( down from 34 an hour ago ). I carefully stopped, turned around and rode back home. I tried pumping up the tire, but a leaky rubber gasket on the bottom of the metal valve stem quickly made it obvious what the problem was. I replaced the stem the next day, It was fine, but the washer had backed off, causing the leak. The seal probably broke when I attached and removed the connector from the air compressor. I am very happy I hadn't reached the highway with what would have been close to a complete flat by then. This is not a negative review for the Cyclops system as in truth I haven't used it becasue the sensor on the front wheel does not clear the brake caliper. 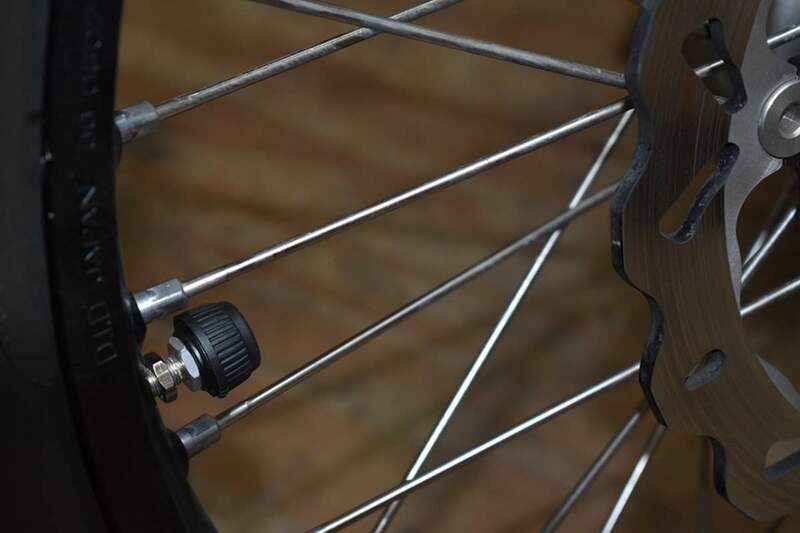 I will install it on one of my other bikes that uses a conventional valve stem as it is definitely something I'd like on all my bikes. Just wanted to let anyone know who might be considering purchasing this setup for their S1000XR. I wish this had been detailed in the product description before purchasing. The tams part seems to work fine but in sunlight or even just a bright day, the screen is unreadable. This bearing in mind most of us wear sunglasses when it is bright sun? I had to replace a sensor on my factory TPMS and I can tell you it was way more than the cost of this entire system! The price and features offered here are a steal! Occasionally you find a product that works as well as it's advertised to. Installation was very simple and everything worked the minute it was turned on. Since my rear tire has a high recommended PSI - 42 - the over pressure warning came on frequently during high summer temperatures. A guide on how to set this parameter would be helpful. I have been running the cyclops TPMS for about two months now. It really is nice to see the tire pressure in real time. 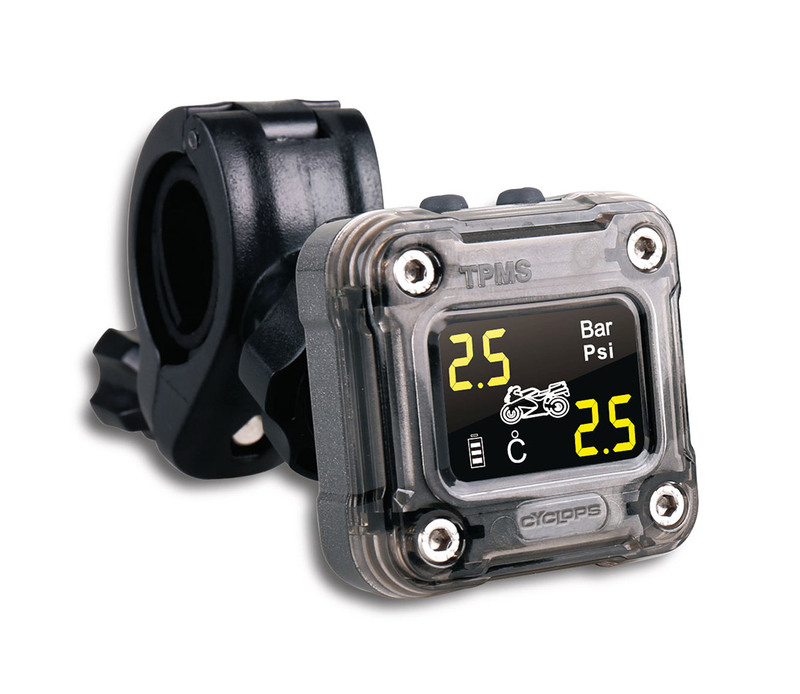 The product is very easy to install, rugged and gives air pressure and tire air temp readings. 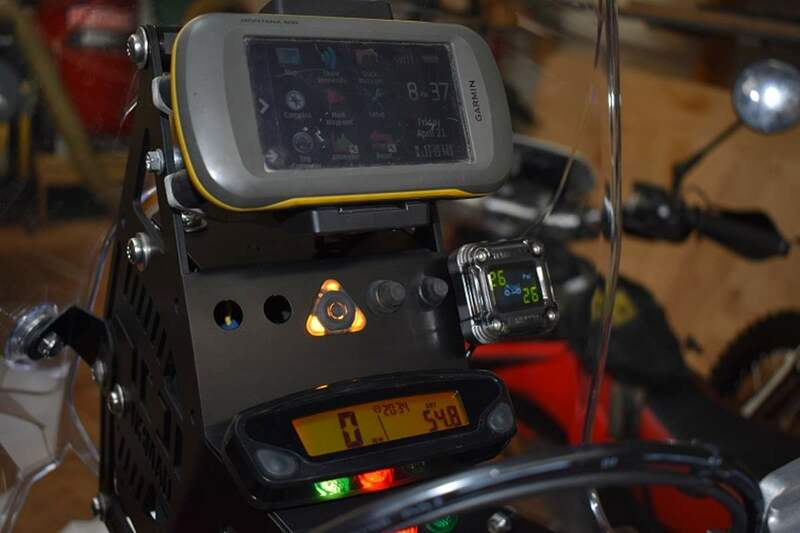 I have ridden my GS in heavy gravel and rocks and now have close to 6000 trouble free miles with the TPMS, The tire air temp is in C, but does work well . I am sure it will last a long time and based on the this and other Cyclops products I have I know the customer service is first class. Great job again Cyclops!